According to information released by Statistics Estonia on Wednesday morning, in August 2018, the exports of goods increased by 7% and imports by 11% compared to August 2017. 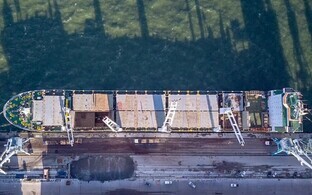 The growth in trade in August was affected the most by an increase in trade in mineral products, including fuel additives and motor spirits, and raw materials and products of the chemical industry, including fertilizers. 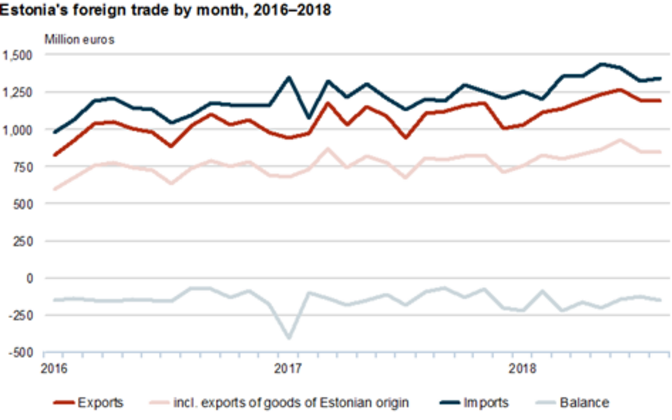 In August 2018, exports from Estonia amounted to €1.2 billion and imports to Estonia to €1.3 billion at current prices. 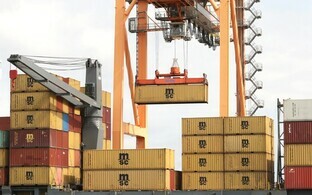 The trade deficit totalled €155 million euros, up from €96 million last August. 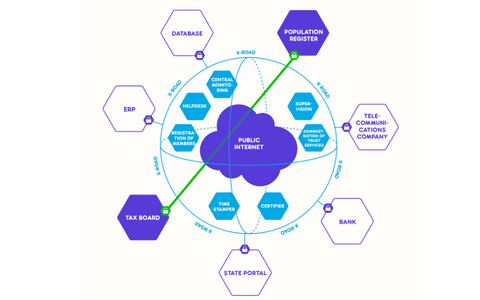 In August 2018, the top destination countries of Estonia's exports were Finland (17% of Estonia's total exports of goods), Sweden and Latvia (11% each). Electrical equipment and base metals and articles of base metal were the main commodities exported to Finland; electrical equipment and wood and articles of wood were the main commodities exported to Sweden; mineral products (electricity, fuel additives) and agricultural products and food preparations (raw milk, beer) were the main commodities exported to Latvia. The biggest increase occurred in exports to the USA (quadrupled, or up by €58 million), Saudi Arabia (up by €13 million), and Finland (up by €12 million). In exports to the USA, the exports of electrical equipment (data communication equipment) and mineral products increased the most. There was also an increase in the exports of mineral products to Saudi Arabia and wood and articles of wood to Finland. The biggest decrease occurred in exports to Russia (down by €13 million), with smaller exports of raw materials and products of chemical industry (caulking compounds and other mastics). In August, the biggest share in the exports of goods was held by electrical equipment and mineral products (both 15% of the total exports of goods), followed by wood and articles of wood, miscellaneous manufactured articles, and mechanical appliances (9% each). The greatest increase was recorded in the exports of mineral products (up by €28 million) and mechanical appliances (up by €16 million) and raw materials and products of chemical industry (up by 14 million euros). This August, the share of goods of Estonian origin in total exports was 71%. 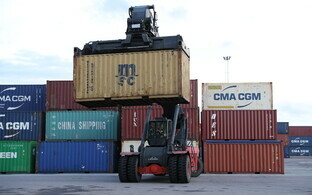 The exports of goods of Estonian origin increased by 4% and re-exports by 14%. In the exports of goods of Estonian origin, the greatest increase was in the exports of mineral products (electricity, heavy oil), wood and articles of wood (coniferous pulpwood, plywood). The share of goods of Estonian origin was largest in the exports of wood and articles of wood (97%), miscellaneous manufactured articles, paper and articles thereof and vegetable fats and oils (92% in each). The share of goods of Estonian origin accounted for 71% of the exports of mineral products and 54% of the exports of raw materials and products of chemical industry. The main countries of consignment in August were Finland (12% of Estonia's total imports of goods), Lithuania and Russia (both 11%). From Finland, mineral products and electrical equipment were imported the most. In imports from Lithuania, mineral products and agricultural products and food preparations had the highest share, while mineral products and raw materials and products of chemical industry were the main commodities imported from Russia. The biggest increase occurred in imports from Russia (imports doubled, or increased €72 million euros), Belarus (up by four times, or €26 million euros) and Lithuania (up by €26 million euros), with the imports of mineral products (fuel additives, motor spirit) increasing the most from each country. The main commodities imported to Estonia were mineral products (16% of Estonia's total imports of goods), electrical equipment (13%) and mechanical appliances (10%). The greatest increase was in the imports of mineral products (up by €91 million) and raw materials and products of chemical industry (up by €23 million). In August 2018, the foreign trade export volume index increased by 6% and the import volume index by 4% compared to August 2017.